Fall is apples, acorns, and leaves! Incorporate these themes into hands on literacy activities with your kids including this free alphabet apple tree printable. We're back for autumn with the Virtual Book Club for Kids! Join us over on Facebook for a children's book with tons of fun activities to try along with us after you read. This month we're featuring Ten Red Apples by Pat Huchinson! 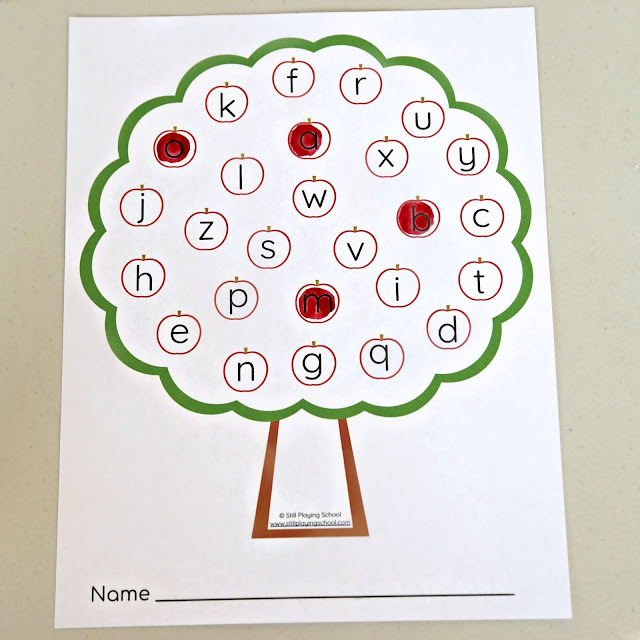 We've created an alphabet apple tree in both uppercase and lowercase versions to inspire plenty of literacy learning while teaching or reviewing letters with preschoolers! There are so many ways you can use these with kids. 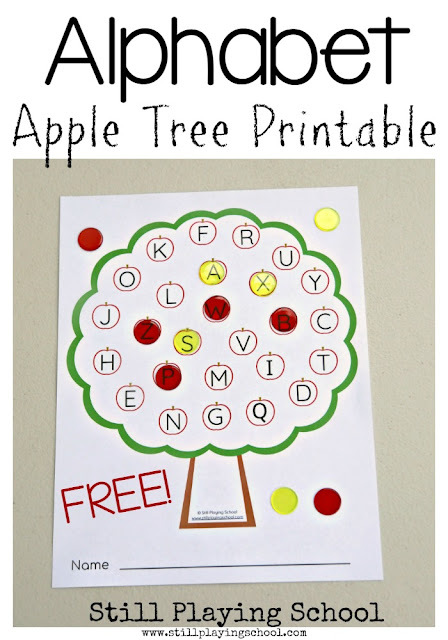 Print the alphabet apple trees to get started. I intentionally designed them to save on ink when you print. Optionally, you may choose to print them in grayscale mode. You can put them in reusable page pockets or laminate them (This laminator is an all star in our house!) 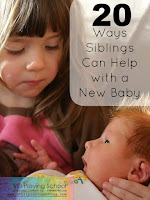 or make a copy for each child. - Use transparent counters to mark the letters. 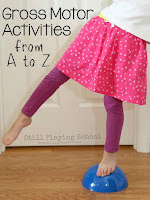 We love these because you can still see the letters as you play. offered red and yellow for real life apple colors! "Can you find all the letters in your name? Can you mark the vowels with yellow? Where is the letter A? Please cover it with a red chip!" - Write children's names and the date on each sheet. 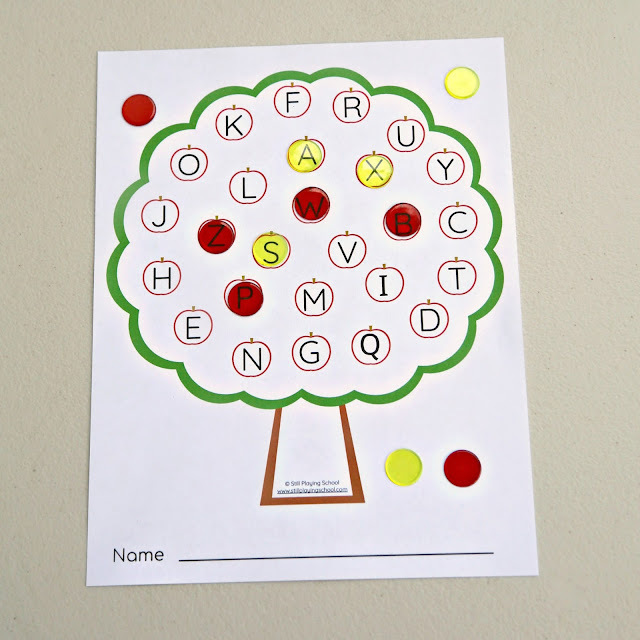 Use these as letter assessments to see what letters (or letter sounds) each child can name. Point to the letters one at a time. If the child correctly identifies the letter, allow him or her to mark the apple with a dot stamp marker. Allow children to take these home to track their literacy progress. For access to all of our free printables for kids, please subscribe to our weekly emails! Get the Apple Tree Alphabet Printables here! I love that the counters you used still let you see the letter beneath them.